What’s more likely to catch your attention: A sales pitch or a story? These days, a presence on social media is all but imperative for most small businesses and entrepreneurs. The thing is, with millions (literally) of users vying for views and an ever-shrinking human attention span, making a strong first impression with your social media is only the first step. To build and engage an authentic community of supporters, customers and clients — you need to keep the good stuff coming. 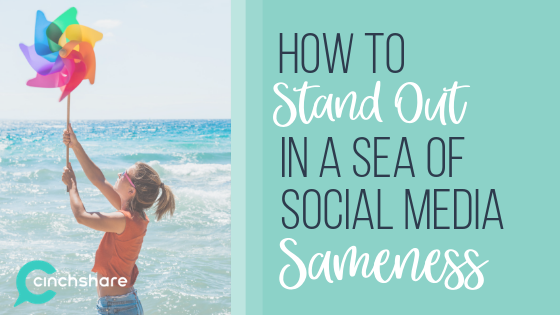 But how do you stand out in a sea of social media sameness? When you’re scrolling through platforms like Instagram, Facebook or Twitter – what’s more likely to catch your attention: A sales pitch or a story? Reusing promotional messages and talking points might seem like an easy solution to the “what should I post” conundrum, but over time, it wears your audience down and they start to lose interest. Using your own authentic voice, personality and perspective is an important piece of building meaningful, lasting relationships. This is as true in romantic relationships as it is in business ownership. However, figuring out where to start, especially for someone who doesn’t consider themselves a “natural storyteller”, can be challenging. In his book ‘Start with Why,’ Simon Sinek makes a strong case for why people become loyal to brands – it starts and ends with your brand’s ‘why’ statement. As users scroll through the literal endless stream of content on social platforms, there are two things that, on average, make them stop and take notice: posting attention-grabbing, visually stunning graphic content that drives engagement and a clear brand identity that stems from a unique ‘why.’ The why of your brand is what will drive success in the long run. You might be asking yourself ‘what is why?’ The answer is simple, because it’s the reason for what you do. While that is different for every brand on the market, the beautiful part is that your why is truly unique to everyone else. All you have to do is share it. Once you have that why, true authentic consumer engagement and growth will follow. At first it can seem daunting to look at, a giant cluster of seemingly randomized words, but hashtags are the best friend you never knew you needed. It helps to think of each and every hashtag as a brand-ambassador you send off into the world in search of engagement. Every hashtag you attach to your content increases your reach and acts like a direct connection between you and your tribe. These people are your ticket to success on social platforms. The most important thing to remember with hashtags is to do your research. If you’re an up-and-coming coffee house, it wouldn’t make much sense to use the hashtag #BodyBuildersOfAmerica. It may be trending right now, but your audience of coffee-lovers will be left with a big question mark over their heads. Utilize all thirty hashtag slots as often as possible – it’s always a good idea to use every tool to your advantage. Pure, unadulterated and unfiltered engagement with your audience is what, oftentimes, becomes the difference between success and failure on social platforms. When a user engages your brand by leaving a comment or asks a question, try to think of it as an in-person interaction. Is it polite to stare at someone after they’ve asked you a direct question about your business without answering? The answer is always no. Not only does it make it more likely that user will engage back with you, thus creating an active dialogue, but certain social platforms use these engagements when using their algorithm to randomly share high-traffic content with other users. On the flip side, the opposite is also true. Leaving comments on other like-minded feeds is crucial – real comments, not just emojis. Imagine if someone in a face-to-face conversation said the verbal equivalent of a ‘heart-eyes emoji’… what do you do with that? Always comment with the intention of interacting, that IS what social media is about. Social is the keyword. In the end, it all boils down to knowing yourself, and your brand, and doing your best to remain yourself with all the, albeit silent, hustle and bustle of the internet. In a world where everything looks and sounds the same, it’s the individuals that truly stand out from the pack. Don’t get discouraged by slow follower-climbs or engagement percentages at the start. Rome wasn’t built in a day, and your audience shouldn’t be either.